I have a bad cold so today I’m changing things up a bit. In lieu of Mindfulness Monday I’d like to share with you an article I read in Mindful magazine. I found it very interesting and plan to put this practice to use. So you may find me doing a lot more blog posts in the future, as I meditate while writing. I don’t want to copy the whole article here, it’s a short article, but it’s not proper to copy someone else’s work, so I’m going to give you the highlights. However, you really need to jump over and read the article to understand what this entails. It’s fun! go do it! He gives us instructions on how to find out just how we can do it. I’m listing just the highlight of each point, you will have to read the article to find out more. At the end of every sentence, stop for a full in-breath and out-breath. Begin with no clear aim. Go ahead, what are you waiting for, jump over to Mindful and find out more about mindful writing. I’d love to hear your thoughts on it. I don’t usually do challenges, mainly because I know so many amazing bloggers I can never decide who to pass the challenge on to, but when Kim, from I Tripped Over a Stone, nominated me, I thought, “Quotes? Hey, that’s up my alley!” So I couldn’t say no. Kim is an amazing woman. She’s witty, smart, busy, and just happens to have fibromyalgia. She is full of knowledge that she readily shares on her blog and in a Facebook group she helps run. Follow the link above and check out her incredible blog! Thank you Kim for selecting me to participate in this challenge. So, today we’ll take a little break from Mindfulness Monday and do these quotes instead. Kim changed the challenge up a bit and did all three of her quotes in one day, I think I’ll follow suit and do the same. This is my favorite quote of all time because everyone needs someone who believes in them, and I always knew my mother believed in me. I specifically remember her telling me this when I was in college. I was struggling putting myself through school, working many part-time jobs and taking a full load of classes so I didn’t waste any tuition money. (You had to take at least 9 (or was it 12?) credit hours a semester to get full time tuition. Over that minimum requirement you could take more classes for the same price. So I normally took 15 – 18 credit hours per semester – that’s 5 – 6 classes.) At one point I was afraid I wouldn’t be able to finish. I was working so hard, and I had the grades to prove it, but I was getting worn down. (at one point I had 5 part-time jobs) My mother was always my champion. I called her one day just to chat and mentioned how hard things were at that moment and how I just didn’t know if I could carry on with that pace. I also mentioned how much I missed her banana pudding. That afternoon when I got back to my dorm, my mother was there waiting on me, with a big bowl of banana pudding. We had dinner together and talked and talked, like we often did. She told me how much she believed in me. She knew how hard I was working and she also knew I could handle it. It was her belief in me that pushed me forward, and the next semester I was awarded a scholarship for outstanding academics and art. I was also given a work study opportunity, so I didn’t have to have all those part-time jobs. If it had not been for my mother’s belief in me, I don’t think I would have been able to follow through and graduate with honors. I hear it all the time, “I can’t afford to give….” This simply isn’t true. “No one has ever become poor by giving.” How very true. We must remember that even the poorest of us can give without causing ourselves more hardship. We can give of our time, there are so many lonely people in this world, all you’d need to do is spend a little time with someone who needs the company, this doesn’t even have to be in person, you can reach out to someone online, you may even make a new friend. We can give a service, can you cook, sew, garden, babysit?….there are so many ways we can give simply by doing what we know, we don’t have to buy anything. We can give a smile and a compliment, has there ever been a time when a stranger smiled at you and complimented you out of the blue? How did it make you feel? A kind word can mean the world to someone, you never know, they may be going through a really rough time and your kindness helps just a little. Don’t believe that you can’t make a difference simply because you can’t give monetarily, there are many ways to give that don’t cost a penny. Oh there are just so many in my blogging family that I’d love to see do this challenge, if you’d like to do it, please let me know in the comments so I won’t miss it!! If you don’t want to do the challenge but have a quote that is meaningful to you, I’d love to hear it!! 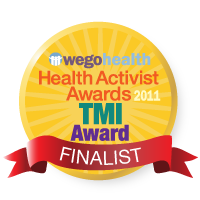 Shout out all your favorite Health Advocates! Make sure to share a few sentences explaining just how grateful you are for them. Listing all of my favorite Health Advocates would take up a book. There is no way I can give a shout out to all of them in this tiny amount of space. When I first read this prompt I thought it read that I was to give a shout out to my favorite health advocate, and I thought that was impossible, but I thought of a way to do it, kind of. Listing all, really is impossible. Please see my post from Friday, Friday Follow, for a list of many of my favorites; there are still more, but that will give you a good start. Today I’ll just list a three blogs I’ve been following the longest that I feel are still doing an exceptional job. Denise is an advocate for Meniere’s Disease, hearing loss and service dogs. She tells her story with wit and flare in a weekly post on her blog Hearing Elmo. There you will hear about her life with Meniere’s Disease, working and studying in academia, her family, life with a service dog, and her Faith. I’m proud to call her friend. Madelyn writes at ADD…and so much more, as you can tell by the title she is an advocate for ADD…and so much more! Madelyn’s blog is a place for her to “let you know about new ADD opportunities and to post all kinds of seemingly disconnected content.” This blog is intended to help: anyone with an Executive Functioning Disorder. I don’t have ADD and I get so much from her blog. She is an ADD coach, has won a number of awards, and I think she’s just the bomb. Kara from Polishing Dookie does an exceptional job making people feel comfortable with her illnesses with a sense of humor and intelligence that keeps you reading. Her tag line “Making the most of the sh*t I’ve got left” shows her sense of humor about her IBD (Irritable Bowel Disease). Kara takes you on a ride that is her life, and you will be happy to join her. Was starting your advocacy journey a hard decision? Were you anxious and hesitant or were you excited and ready to share your story? Tell us how you chose to start advocating for your condition. The start of my advocacy journey for Meniere’s Disease and other chronic illnesses is kind of a long story. First I found out I am allergic to wheat and suspected to have celiac disease. Here, let me ‘splain….I had been generally sick for a long time when I found out I’m allergic to wheat, so I stopped eating wheat. I started to feel a whole lot better, but I was still getting sick sporadically, so I decided to stop eating gluten. My doctor then suspected that I may have celiac disease. I was given the blood test but tested negative, I was given it again and tested positive. This provided no definitive results, so I would need a biopsy from my small intestines. However, the only way for this test to work was for me to start eating gluten again for a month or two. I asked what the treatment was if I was found to have celiac disease and it was a gluten free diet. Well I was already eating that way, so I decided to just keep on a gluten free diet instead of having the test. Maybe I’ll have it one day, but probably not. The doctors are pretty sure I have it due to the last blood test, I don’t really care, I know I can’t eat gluten. This was before there was a lot of knowledge about a gluten free life style and celiac disease, so I became an advocate. I started a blog and worked hard to bring awareness. I worked with local groups. I was a taste tester for Whole Foods Gluten Free Bake House. It was an exciting time for me, I felt like I was making a difference. Then my Meniere’s Disease got so much worse. When the Meniere’s Disease went bilateral, meaning I suddenly had it in both ears instead of one, I had to rethink my life. (if you don’t know about Meniere’s Disease, and you’d like to, please see Meniere’s Disease-My Story at the top of the page.) Once I saw my new doctor at Duke Medical Center I had renewed hope (more than I should have really). I was going to focus on getting healthier. I wanted to increase my exercise and start eating even healthier. I decided to stop writing my gluten free blog and start a blog all about me getting as healthy as possible with Meniere’s Disease and (suspected) celiac disease. This blog was called 365 Days to a Healthier Me. I soon discovered I was not going to be able to focus as much on getting healthier as I was on simply getting through the day. The vertigo was happening almost daily and I was losing my hearing rapidly. I decided to start writing about my experiences with Meniere’s Disease (I stopped writing about a gluten free lifestyle by then) and this naturally morphed into advocacy. I found others were out there who were struggling as I was and needed some support. Soon I started talking about other illnesses I struggle with on a daily basis, such as chronic migraines and bipolar disorder. I have found that people with chronic illnesses need a voice. I hope I can add a little voice to a lot of other voices. After the loss of my hearing and with continued struggles with vertigo I haven’t been able to advocate in person, but I continue to try to keep up the good fight via the internet. Sometimes I’m not able to do as much as I’d like due to my illnesses, but I’ll keep trying. That’s all we can do. Keep trying. *All images on this site and the creation of Wendy Holcombe unless otherwise noted. #HAWMC Day 5 – What’s your favorite platform to get your voice heard? Are you all about 180 characters or less? Do you enjoy shooting the perfect photo? Or perhaps love sharing posts on Facebook.What’s your favorite platform to get your voice heard and why? Okay, I’m going to admit this is going to be a very short post for me. My favorite platform to get my voice heard is my blog. Here I can write it in 180 characters, but I don’t have to. I can use as many characters as I like. I can add a photo if I want, but I don’t have to. I’m free to share my opinions along with facts. Of course, I always tell if it is my opinion and not a fact. (that doesn’t mean my opinions aren’t fact, often they are…so there.) My blog is my preferred method to reach people. I don’t think I’ll ever be on Instagram or any place where I’m supposed to post photos, I’m simply not comfortable snapping photos all the time, especially of me. And I must admit…. hubby would make fun of me. It’s not all about what I post on my blog or Facebook Page and Twitter accounts, it’s also about the places I visit. The blogs I support, the Facebook Pages I Like, the Facebook Groups I Follow, the Twitter accounts I follow…these are the places I show my support. These are some of the places that hear my voice. Look in your comment section, you just might see me there. If you’d like to read more posts from today please check out WEGO’s Facebook page. and don’t forget to check out Picnic With Ant’s Facebook Page too. 🙂 and you can find me on Twitter too. *I accidentally hit publish on this post on November 4th, however, I should only have hit Save. I hope everyone saw the completed post.